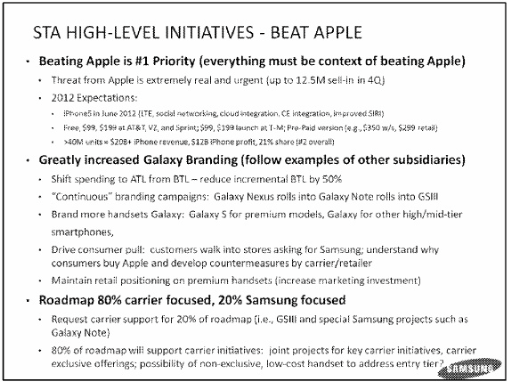 The documents, which were spotted by AppleInsider, showed Samsung declaring that “beating Apple is #1 priority” for 2012. The Korean company warned employees that the “threat from Apple is extremely real and urgent.” The memo came out at the end of 2011, when Apple lodged its first patent suit against Samsung. If you want a comprehensive timeline of this whole mess, click here. Samsung predicted that Apple would sell more than 40 million units of the iPhone and corner 21 percent of the smartphone market. This turned out to be an extremely modest estimate since Apple sold more than 125 million. Samsung’s efforts caused Apple executives worry. Internal emails from Apple, which were entered into evidence in the latest trial, showed concern over Samsung gaining ground. “I watched the Samsung Super Bowl ad that launched today … it’s pretty good and I can’t help but thinking these guys are feeling it (like an athlete that can’ miss because they’re in the zone), while we struggle to nail a compelling brief on the iPhone,” said Apple marketing head Phil Schiller, in an email obtained by Recode. “Something has to change. Fast,” Schiller added. The amount of dirt that’s been exposed is remarkable considering the new trial is less than a week old. With $2 billion at stake, we can safely predict more jabs from either side.